Street trash | Park View, D.C. 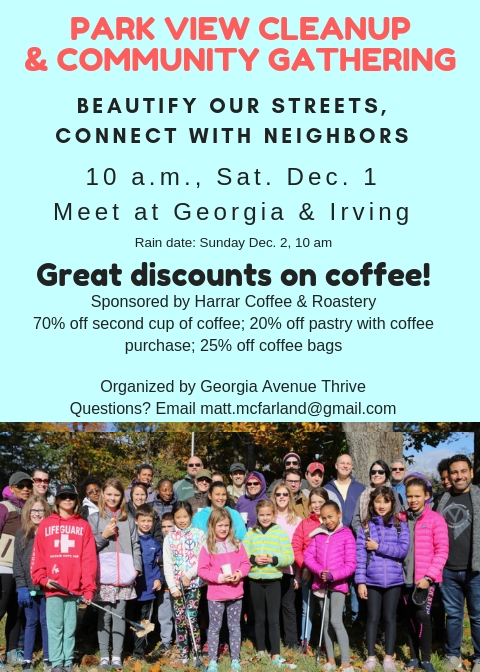 The next Park View cleanup is scheduled for Saturday, December 1st. See flyer below for details. Litter can with trash bag of household trash, Rock Creek Church Road and Warder, NW. 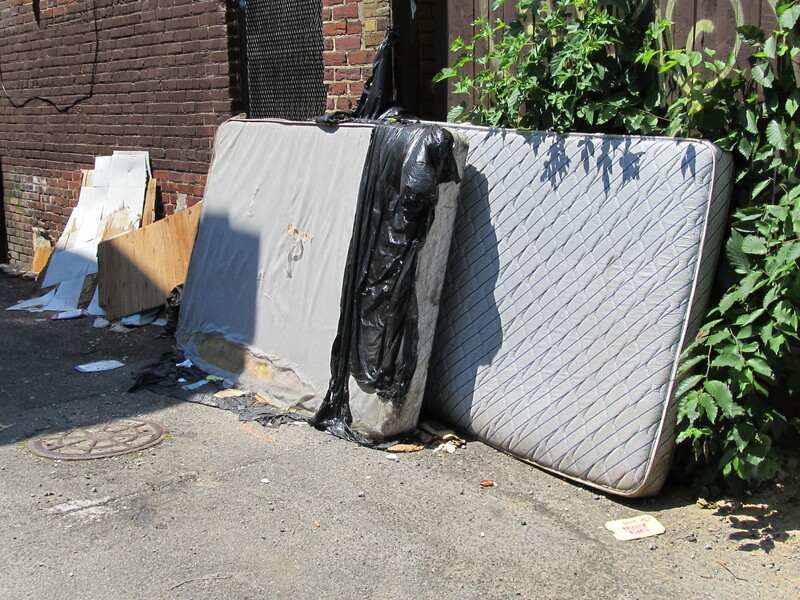 A frustration I’m sure I share with many residents is the amount of illegal dumping that occurs in the neighborhood. Much of this centers around our littler cans which are not intended to be collection points for household and other bulk trash items. 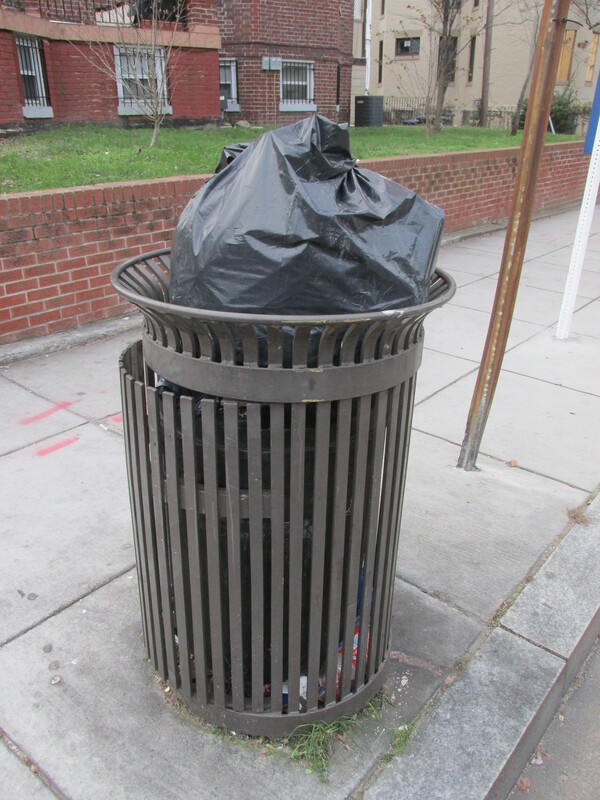 Over the years, I’ve observed that the litter cans on New Hampshire Avenue are heavily used for household trash, as are the litter cans at Warder and Rock Creek Church Road and other litter cans around the neighborhood. I’m convinced that part of the problem is the conversion of rowhouses into multi-family dwellings without having a plan in place for trash collection. While this isn’t a true cause and effect relationship, the issue is when a property has four or more dwelling units then it is no longer eligible for city trash collection. Buildings with four or more units are required to hire a private trash company for collection. I suspect that some landlords don’t do this and attempt to get by with city trash pick up, leaving residents to figure out what to do with trash that isn’t collected. Naturally, they turn to the area little cans. While I hope I am shown to be wrong on this, I’ve decided to officially reach out to DCRA to request that they perform an audit to ensure that our larger buildings have the necessary contracts for trash collection in place. I’ve been receiving a number of requests from residents to assist them with getting bulk trash out of their alleys lately. This usually includes old mattresses, but can include anything that doesn’t fit in the trash can put out for regular trash collection. The easy answer to this problem is the Citywide call center at 311. 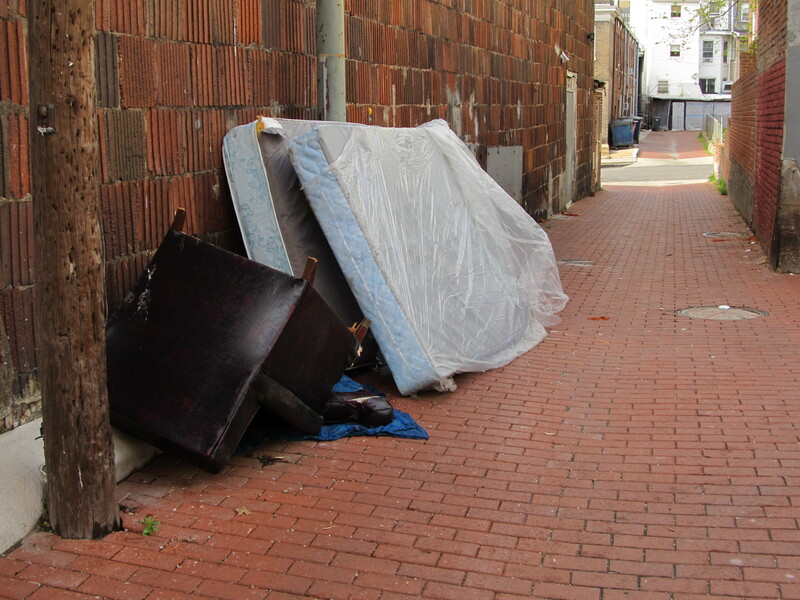 By dialing 311 you can report illegal dumping if you notice some in your alley. You can also dial 311 to schedule a bulk trash collection. I suspect that some of the problems I’ve been alerted to are nothing more than residents putting bulk trash out for their regular trash pick up and not realizing that they need to make a special call … so … I am including the information from DPW’s Website on the issue below. DPW collects large, bulky items by appointment from residential households that receive DPW trash collection service. These households include single-family homes and residential buildings with three or fewer living units. Call the Mayor’s Citywide Call Center at 311 to make an appointment, which is usually available within seven to 10 days of your call. Up to seven items may be collected at one time. Customers with more than seven items may request additional appointments. Bulk items are picked up at the same place you set out your regular trash. Residents also may drop off a small number of bulk items at the Ft. Totten Transfer Station at 4900 John F. McCormack Road, NE, weekdays from 1 pm to 5 pm and Saturdays from 8 am to 3 pm. The transfer station is closed on holidays. Up to four tires may be brought to Ft. Totten only for disposal. Apartment buildings with four or more units, condominiums, co-ops and other commercial properties must have their bulk items removed by a private, licensed hauler. Find a list of registered recycling haulers in the Commercial Recycling Guide. Renovation material as bricks, concrete, construction and demolition materials, and dirt are not accepted at Ft. Totten. Please visit buildersrecyclingguide.com for a list of construction and demolition companies who may haul these items. Call 311 to set up an appointment before putting your bulk items out for collection. Put your bulk items out no earlier than 6:30 pm the day before and no later than 6 am on the day they are to be collected. Place them where your trash and recycling are collected. You could receive a sanitation violation ticket if these items are in the public space at any time other than your collection appointment. Remember, no more than seven items will be collected per appointment. Where are Our Illegal Dumping Areas? Here’s are two questions I’d like to throw out to the community. What can we do to get ahead of this problem? My guess is that the first thing we need to do is have a comprehensive list of known trouble areas. 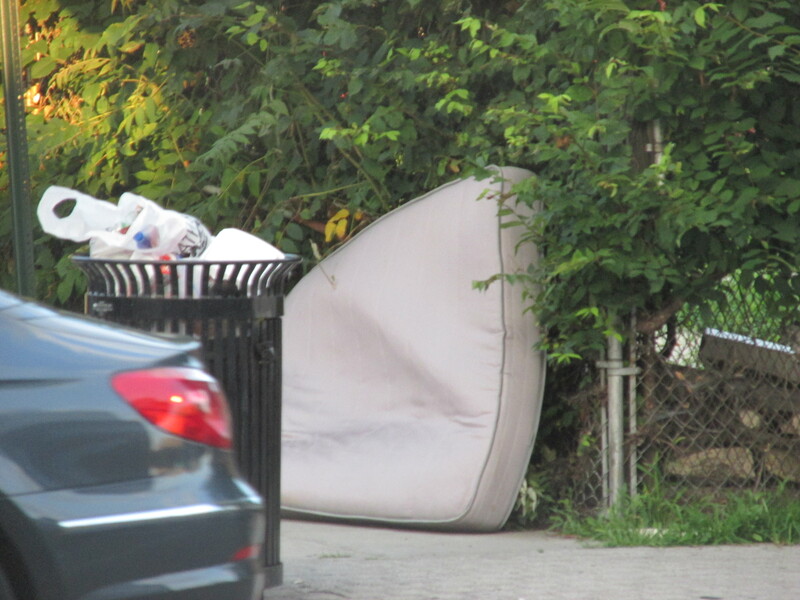 As an example, I noticed yesterday that yet again two mattresses and a chair had been dumped in the alley behind the Fisherman of Men Church (former York Theater) located at Georgia and Quebec. This is a problem spot that has been going on for years. I know there must be other hot spots in the area. Perhaps by identifying them and consistently reporting them we can eventually get ahead of this problem. At the least, we should be able to get organized enough to get the illegal trash removed in a timely manner. Dumpster Dumping, or, Why Did the Dumpster Cross the Road? 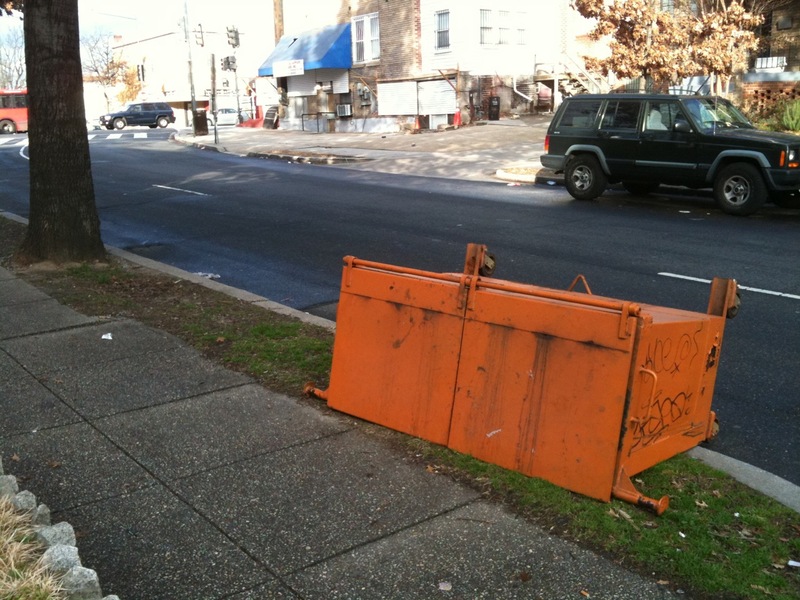 Street trash is a perpetual issue in Park View, but February 1st was the first time in recent memory where a dumpster was itself the street trash. As you can see below, on Wednesday morning a roll off dumpster on Irving Street (just east of Georgia) was oddly located across the street from its traditional location. Best guess is the orange dumpster was not properly secured in the adjacent alley and rolled away to the other side of the street. Of course, it’s also possible that it made the journey with a little help from friends. In either case, by the end of the day it had been returned to its normal position in the alley. Did you know you can help DC Water keep streets from flooding and keep trash out of our waterways? 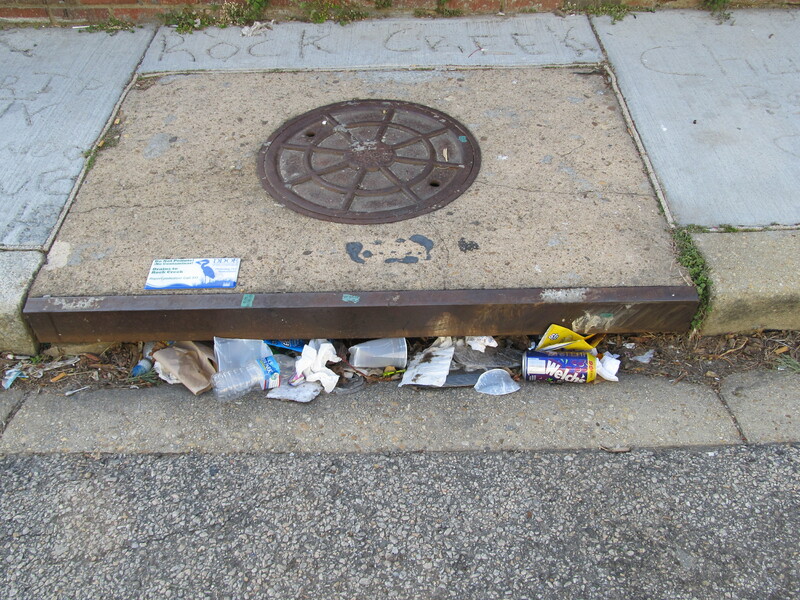 In order to help DC Water with their regular cleaning … which ultimately helps prevent flooding in the neighborhood … residents can report clogged catch basins for service. This can be done by either calling (202) 612-3400 or sending a tweet to @dcwater. Be sure to identify the location as specifically as possible. I’ve recently reported two clogged catch basins via Twitter and look forward to seeing how well it works. 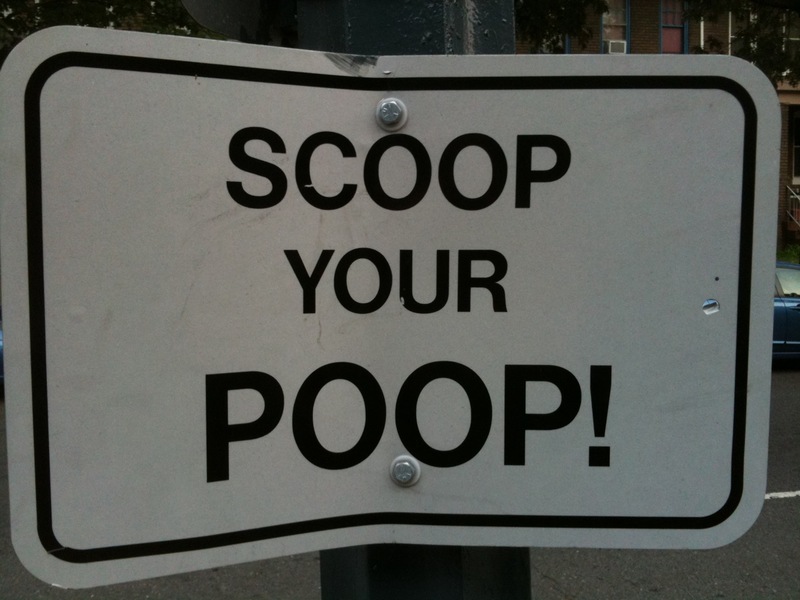 Dog waste that is left on sidewalks and in the parking along streets continues to be a bit of a community problem. While this can be particularly nasty in the winter, now that warmer weather is here the issues of children’s health and providing food for rats become ever-increasing problems. I’m encouraged that the neighbors I’ve spoken with who tend to be the angriest about unclaimed excrement tend to have dogs themselves and tend to speak out when they witness someone not doing their civic duty. There are a couple of ways that this issue has been addressed, but I personally wonder how effective any of them are. The area has several locations where signage is posted. The triangle park at Park Place and Rock Creek Church Road has a sign as do several locations in lower Park View — specifically along Irving and Kenyon Streets. The most effective method tends to be just calling a transgressor out when you see it, but even that can sometimes lead to altercations. 2) Provide FREE plastic bags to assist pet owners. 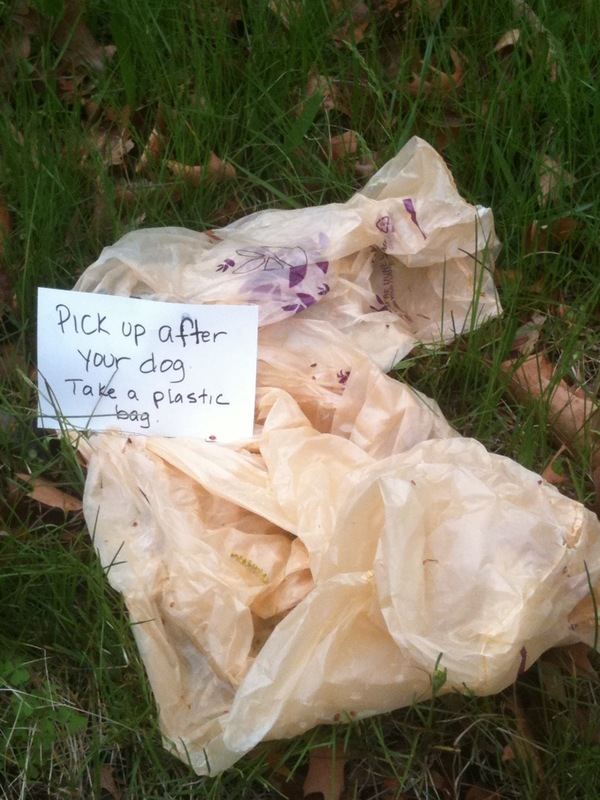 "Pick up after your dog. Take a plastic bag." The Department of Public Works, on the other hand, created the flier below to address the issue. Clicking on the image will get you both English and Spanish versions. Yet again, I wonder how effective they are since I don’t recall ever seeing them distributed publicly. Carman, Tim. "GoingOutGuide: The $20 Diner: Mothership is Park View’s new refueling zone," The Washington Post Friday, May 2, 2013. Wax, Emily. "Post Magazine: Can Soldiers’ Home residents and urban gentrifiers overcome barbed wire?," The Washington Post Friday, March 1, 2013. Dena Levitz. 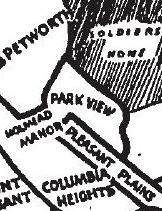 "Park View: It's Not Petworth," Urban Turf [blog], Friday, August 3, 2012. Ann Cameron Siegal, "Park View neighborhood in District is pleasantly walkable," The Washington Post Saturday, May 1, 2010. Kent Boese, "'Houses with Novel Points': Kennedy Brothers, Princeton Heights, and the Making of Northern Park View," Paper presented at the 36th Annual Conference on Washington, DC Historical Studies (2009). Michael Schaffer, "Post-Mortem," Washington City Paper 18, no. 9 (1998). Is something happening on your street the rest of Park View should know about? There are no reported Metrorail disruptions at this time. While Target and other retailers deal with hackers stealing personal data, consumers may opt to pay in cash. Here's how to protect yourself from getting your personal information stolen at the ATM. Police say three people--including two juveniles--were stabbed across the street from a Northeast Washington recreation center. TSA officials say they stopped a man with two unloaded guns in his carry-on bag at Reagan National Airport. The former CEO of the Human Society of the United States has also joined the effort. 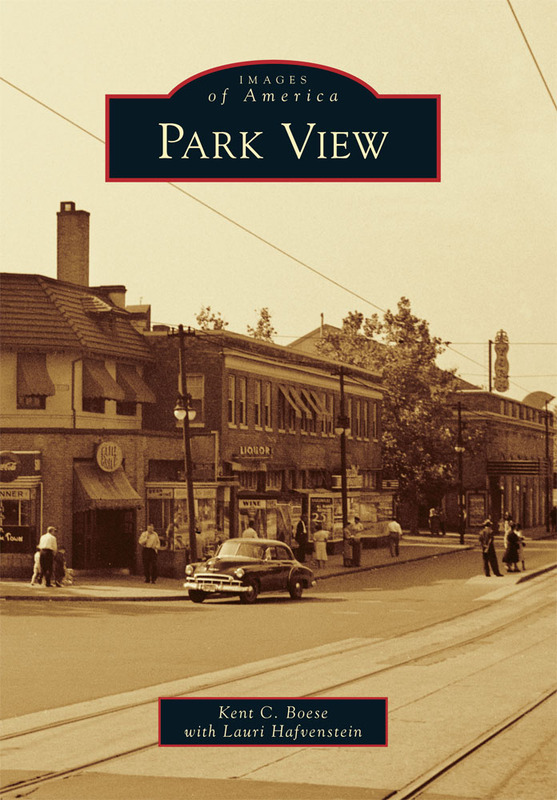 Park View, available locally at Sisterspace and Books or online at Amazon.com and downtown Washington Barnes & Noble locations.